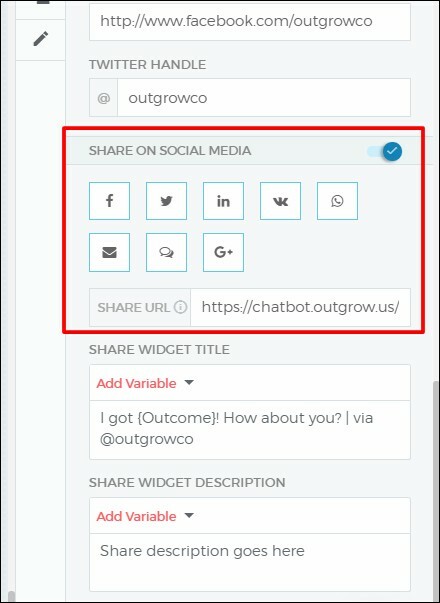 This blog details how to create a survey chatbot on Outgrow. Furthermore, it elaborates the function of the same. We have said it before, we’ll say it again. New Years are all achieving our best self. While we are on that topic, let’s talk about surveys. Surveys are extremely important for a company that aims to improve itself. Ourselves included. However, 72% of customers say surveys interfere with their experience of a website. In fact, the same study found that 80 percent of customers have abandoned a survey halfway through. How do we get around this mess? Four words: create a survey chatbot. What Is A Survey Chatbot? Now let us dive deep into the topic. First of all, here is a stat that might cheer you up: 87% of survey-takers want to have a say in a company’s future products and if it is interesting. Common sense dictates that our dear customer are willing to take part in the survey as long as it sports an excellent design. Consequently, the good ol’ surveys forms don’t work anymore. How do we get around this mess? Those four words strike again, but this time with a little addition: create a survey chatbot on Outgrow. 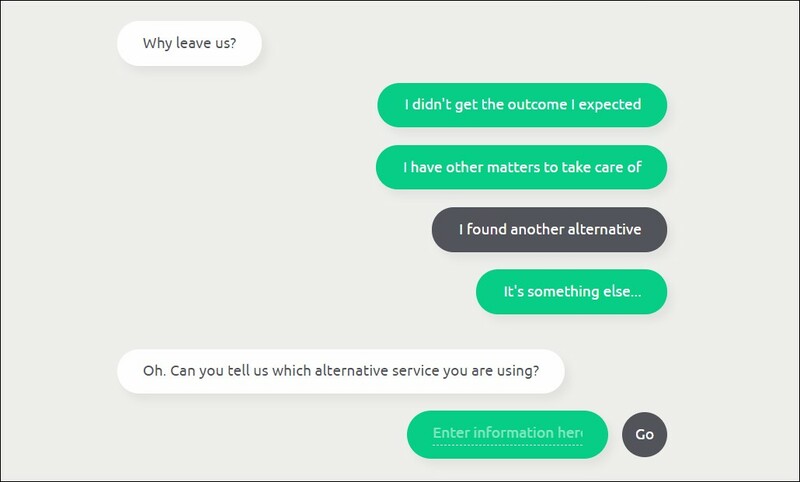 Survey chatbots can be best described as a ‘virtual interviewer’. Only if the interviewer had an interactive edge and a kickass user-friendly design. It allows the respondents to answer the survey questions in a matter of seconds from their devices. In fact, 52% of people say they would not spend more than three minutes filling out a survey. Now, isn’t this a handy solution? Moreover, survey chatbots save the precious work hours of your employees. Let the tool handle all your grunt work and put your human resources to good use! However, it doesn’t only cater to the need of your users. In fact, it allows you to gather the contact information of your leads that might be interested in your services. For the purposes of this blog, we’ll create a survey chatbot in the form of an exit assessment. 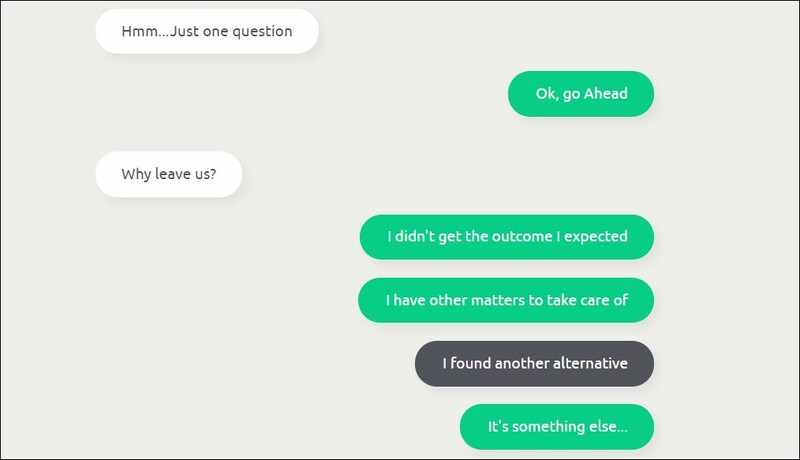 The aim of this chatbot will be to gather the reason why the client is leaving. This will allow the company to understand where they are lacking and improve their services. Moreover, it will eliminate the hours wasted by the company’s employees while conducting fruitless surveys. 1) Sign up for Outgrow right here! 2) Select “‘Chatbot” from your Outgrow Dashboard. 3) Start by customizing your welcome screen. Make sure to personalize the survey by adding your logo, a suitable color theme etc. 5) We have included limited options here. This is in line with the best practices for chatbot creation. 1) Text Input- This allows the user to input answer in alphabetical form. 2) Multi-Select- This allows the user to select numerous options. 3) Single Select- This allows the user to select a single option. 4) Rating- This allows the user to reply in rating. 5) Date/Time Picker- This allows the user to select date and time. 7) You can choose to add a Logic Jump to any of your questions. However, this is will be based on the input by the customer. In this case, if the user selects ‘I found another alternative’, they are redirected to this question- ‘Which service are you using?’ However, if the user selects another option, he is redirected to another option. 8) It is possible that you have abundant options and do not want to enter manually. 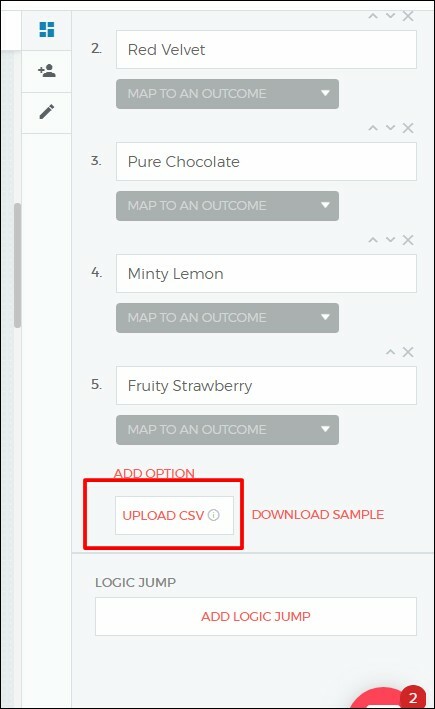 In such a situation, you can upload your options through an Excel sheet and CSV format. 9)Put your Lead Generation Form after the questions in this experience. With the new added ‘Chat embed’ feature on Outgrow, gathering leads will be easier than ever. 10) Design your Outcome page with preferred pictures and social media channels. Furthermore, you can customize the widget title and its description. 11) Select the preferred background color from the custom pallets. 12) Make sure to add a relevant Call To Action for your users! 13) The new Outgrow update allows you to send email notification of as many characters as you want. Moreover, you can customize the mail you get in case the tool gathers a new lead. 14) You can build integrations to send your Outgrow leads to other apps. For example- Salesforce, Marketo, Aweber, Mailerlite etc. 15) You can embed the chatbot in a pop-up, chat or a custom embed. In the end, your survey chatbot will look a little like this. There! We have spilled all the tea on how to create a survey chatbot. In fact, how about you create some yourself? Meanwhile, we’ll stick to our resolution of continually improving ourselves for you.